This calculator will calculate the principal and interest payment amount required to repay a small business loan within the desired time frame, using your preferred payment interval (monthly, quarterly, annually, etc.). And unlike the typical small business loan calculator, this calculator has an optional profit margin percentage field that, if filled in, will estimate how much in sales revenues your business will need to generate in order to repay the small business loan principal and interest. But be forewarned, if you don't want to be talked out of starting your business, you may want to leave the profit margin field blank! And finally, the calculator on this page also includes an option for displaying a loan payment schedule along with the results. 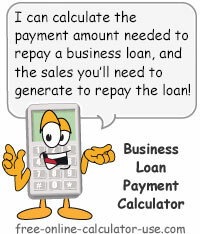 Calculate business loan payment amount and the sales revenues needed to repay the principal and interest. Enter the amount of the business loan, otherwise referred to as the Principal. Enter as a dollar amount, but without the dollar sign and any commas. Enter the annual interest rate you will be charged for the business loan -- which is typically much higher than the going mortgage rate due to the added risk being taken on by the lending institution. Enter as a percentage but without the percent sign (for .08 or 8%, enter 8). Enter the number of years the payment will be based on (typically 30 years). Select the payment frequency you would like to use for repaying the business loan. Generally speaking, the longer the interval between payments, the more you will pay in interest charges. Select the month, day, and year you plan to make your first loan payment. The calculator will use this date to create a payment schedule should you choose to have it included in the results. If you would like to see how much sales your business will need to generate just to repay the business loan and pay the interest charges, enter your anticipated before-tax, before debt-retirement profit margin percentage here. Enter as a percentage but without the percent sign (for .10 or 10%, enter 10). Schedule?Incl schedule?Include payment schedule?Include payment schedule? If you would like the results to include a loan payment schedule, slide the button to the "Yes" position. Based on your entries, this is how much your business loan payment will be for each interval you selected. Based on your entries, this is how much interest you will pay on your small business loan between now and when you make your final payment. Based on your entries, this how much sales revenue your business will need to generate in order to repay the business loan and the interest charges. Enter the annual interest rate of the loan. Enter the number of years to repay the loan. Select the date of the first payment. If you would like an estimate of how much revenue your business will need to generate to repay the loan with interest, enter your estimated after-tax profit margin percentage. If you would like a payment schedule to be included in the results, move the slider to the "Yes" position. Click the "Calculate Loan Payment" button and scroll down to view the results. Three important lessons I've learned in my 30+ years of being self-employed. Believe it or not, it is possible to be earning a 6-figure annual income from your business and still be miserable. Well, that's easy. If you're spending 80-hours a week engaged in activities you don't enjoy, then it's unlikely the 6-figure income and the few hours of free time will be able to make up for all those hours of misery. If you had all of the money you could ever spend, would you still open this business just because it would be an enjoyable way to help others solve a problem that's important to you? If their answer to that question is a "no", then I do my best to persuade them to pass on that particular business opportunity. If you don't enjoy the type of work you will be doing day in and day out, and/or the problem the business attempts to solve for others is not that dear to you, then any financial profits it generates for you will likely be more than offset by your emotional losses. One of the biggest mistakes I made early on in my entrepreneurial journey -- and one I made more than once -- was falling in love with a business idea so much that I felt thorough research of its profitability potential was unnecessary. After going through several business failures it finally occurred to me that it's a lot easier to go broke laying on the couch than it is to work 80-hours a week to go broke. Once I fully embraced that concept I began to approach each subsequent business idea with the mindset that the business idea was destined to fail -- unless my thorough research of its probability of success could prove otherwise. In other words, if I can't make a business idea work on paper, I won't try to make it work in the real world. Case in point: I love to golf and wanted in the worst way to open an indoor golf simulator business in my local community. Well, after locating a few indoor golf simulator businesses in similar sized communities with similar demographics and weather patterns, and keeping a close eye on them, every one of those indoor golf simulator businesses ended up "out of business" within one year of locating them. It was heartbreaking, to say the least. So while watching a beloved business idea fail in the research stage can be heartbreaking, it's much less traumatic and less devastating -- and much easier to recover from -- than having it fail after making a go of it in the real world. Like other forms of "easy access to credit," easy access to small business loans can easily undermine your natural decision-making and problem-solving abilities. It's always easier to spend other people's money -- because it's money you haven't had to earn with your own sweat, blood, and tears. Unfortunately, we all tend to view "borrowed money" as other people's money, when in reality it's not. Because when we are forced to pay back the money we borrow it will be with money we had to earn with our own blood, sweat, and tears. If I had this small business loan amount in my bank account, would I still choose to spend it all to start this business? If your answer to that question is a resounding "Yes! ", and your unbiased research has shown a high probability that the business will be able to repay the loan and still leave you enough to live on, then a small business loan may be worth shopping for. On the other hand, if you had the small business loan amount in your bank account, but you would not consider parting with it to start this business, then you probably shouldn't consider borrowing the money to start it either.